Rust can be a pain to remove, and you may be putting off dealing with it because you don’t want the backache that scrubbing will give you. However, delaying will just make the problem worse and cost you even more money. 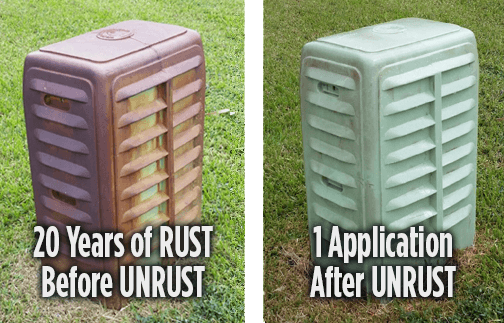 UnRust’s Rust Remover Can Solve Your Rust Problem for Good and is Safe for Your Lawn. 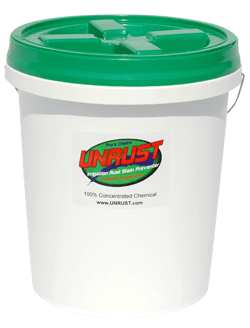 What makes UNRUST Stain Preventer, so unique, is all the other products on the market are diluted down with water. The fact is pre-mixed liquid irrigation rust stain prevention chemicals are much weaker, because of dilution. 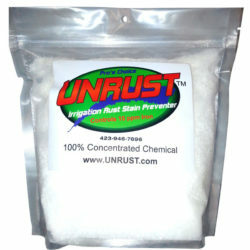 UnRust Stain Preventer is the Strongest Irrigation Rust Prevention Product on the Market Today. 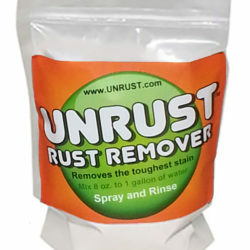 Compare UNRUST to Rid-O-Rust. UNRUST Saves You Time and Money! 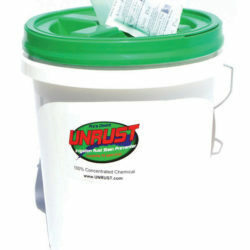 UNRUST Stain Preventer is designed to replace your present liquid chemical, I.E. 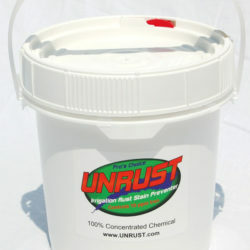 “Other Brands” that you may be using in your existing rust prevention system. 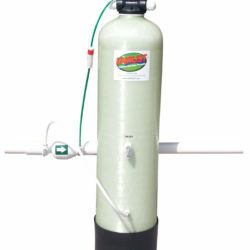 Watch This video of the UNRUST Rust System Being Installed on an Above Ground Pump. I used the UNRUST Rust Remover on my stained "paint" driveway and walkway for the first time today. I cannot believe how fantastic this product works!!!! I needed only three mixed gallons and the stains are absolutely GONE!!!!!! I used to use the premixed liquid from the box stores and would use at least 8 gallons with unsatisfactory results. Then, I would have to power wash to get it somewhat right. I noticed that the professionals working in the neighborhood mixing their own stuff so I thought I would give UNRUST a try. This stuff is absolutely awesome!!!! Thanks for the great product!!! Wow this UNRUST is awesome!!! My son is pressure washing my miles of stained concrete and i apply a thin film of this on top and walkways look like new. I’ve also used it on a walk way without pressure washing and same results. Look like new. Great product!!!! 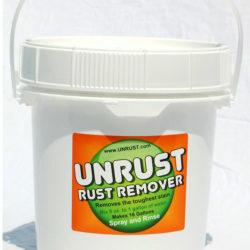 I got your UnRust remover yesterday via UPS and we started this morning on the roof of my 12x12 shed and that roof was almost purple from rust, we did have to scrub a little, but I kept spraying that UnRust Remover on and my God, the rust started running off. With-in a few hours it was almost back to the normal roof color, we really still can't believe what your product did. Then we tackled the 31 foot long shed where rust has come on very fast in the past few months and only on the side facing the sun. We had neighbors watching by now and we sprayed that on and it rolled right off, we never had to scrub a thing, just re-apply in a few areas, so tomorrow we are ready to paint and etc. Personally I didn't believe you or your pictures, but I would try anything at that point and glad you talked my hired help into believing it would work. 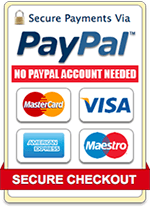 We will be spreading the word how your product really works and I am going to send Arrow Sheds an e-mail next to let them know what to reccomend and going to Home Depot next week so will push your product to them too. 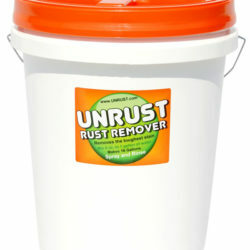 When you want to know how to remove rust, UnRust is the answer for rust removal. Thank You so very much, you have saved me hundreds of dollars. Just wanted to let You know Your Rust Remover works GREAT. Can't wait for more rust so I can remove it! 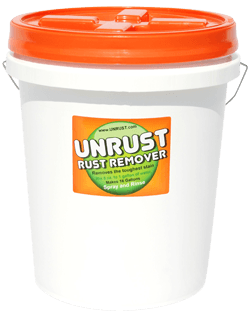 I can't get over how well Unrust works compared to Rid-O-Rust. I have been using Rid-O-Rust for years with little success. Since switching to Unrust Preventer my rust problems are over. Amazing!